Our popular Magic has not reached its present condition all in one go, rather like all other new productions, this highly popular collectable card game has also gone through its share of changes and alterations in its initial phase. The game is loved by a lot of people today and it has become a part of life. People are interested to know more about the game and how it was actually named and formed. This article will inform you about some rare known facts about the creation of the Magic. 1. Magic was not initially named as Magic, rather it was called Mana Clash. When it was designed by Richard Garfield, he named it Magic and during the playtests as well it was called Magic, but as a Lawyer informed Magic will be too broad a term to have a copyright; the team started looking for alternatives; and Mana Clash was the best suggested one. The game went for solicitation as Mana Clash. However, play testers including Garfield continued calling the game as Magic and finally the team added the phrase “The Gathering” to it for getting the copyright, check this cheap magic the gathering cards. 2. 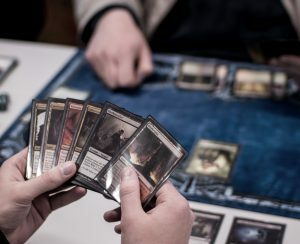 The first Alpha was released with the name “Magic: The Gathering” but the original idea was to reinvent the name with the changes of the game. For example, as Ice Age came up, the game should be called “Magic:Ice Age”. However, the plan could not be implemented because to have a copyright there has to be a continual name for the product. So, if the original idea would have been implemented, now you would not buy magic the gathering cards, rather Magic: Ice Age gathering cards would have make it to your collection. 3. When you buy magic the gathering cards you will surely notice a small box at the backside of the card, written “Deckmaster”. The original idea at the time of creation was to produce a bunch of TCGs, and to identify Wizards from the Coast TCGs, they planned the brand name “Deckmaster” to be added at the back. However, the concept was soon dropped from being added to the TCGs, but as it is vital for every Magic card to look just the same from the backside, hence that branding can be still seen even in the newly printed cards. 4.The mana costs were also planned differently at the time of its design. During the original playtests the spells had different mana costs, but before it was released, the mana costs were altered to the ones as they are today, as Garfield found that the previous way of mana costs were confusing for new players. Now as you know these interesting facts, go on sharing them with your friends. Designed by CodetoRank. © 2018 Dark Corner Collectibles. All Rights Reserved.